Which Full-Width-Half-Maximum is the best one for me? 12nm or 6nm? The question which Full-Width-Half-Maximum (FWHM) is the "best", shows up on in eMails on our monitor or when talking to customers at fairs very often. A general "right" or "wrong" or "best" does not make any sense. -We would not offer both series if they were not needed. When imaging from the city/suburb the images taken with DSLRs and most CCD cameras are limited by the dark current of the sensor and not by the brightness of the sky backgrund. In this case you will not see fainter structures when using a 6nm filter instead of the 12nm version. Additional to that cameras with an integrated guiding sensor will get more stars for guiding with the 12nm filters! If you have a camera with an extremly low dark current and effective cooling, the 6nm filters will give you major advantages: Due to the stronger blocking of the background you will be able to expose longer and get deeper images! All stars are very tiny points, most faint stars do not show up anymore! -This is a major advantage even for normal cameras, as you can take images of faint structures even in star-crowded regions of the milkyway! To put it short: 12nm Filters are the right choice for all DSLRs and dark-current limited cameras. 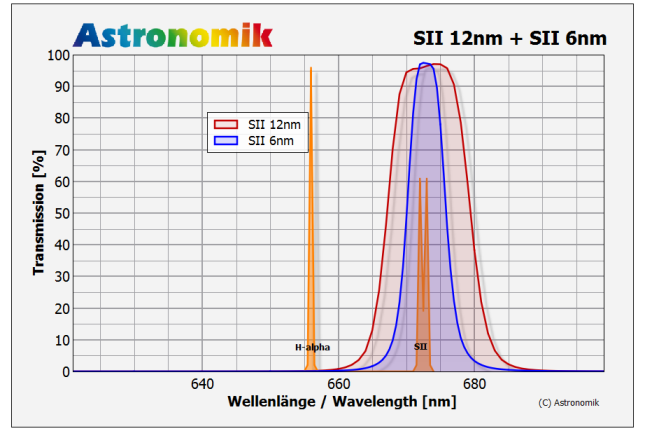 6nm filters are the best choice for observing sites with extrem strong light pollution, cameras with low dark-current and when weak objects require the maximum contrast and star-reduction possible! How much is exposure time increased? This question is asked quite often, and the answer is very easy: You don have to expose longer, but you MAY expose longer! Due to the high transmission of approximately 100% at the center wavelength nearly all these photons reach the sensor. 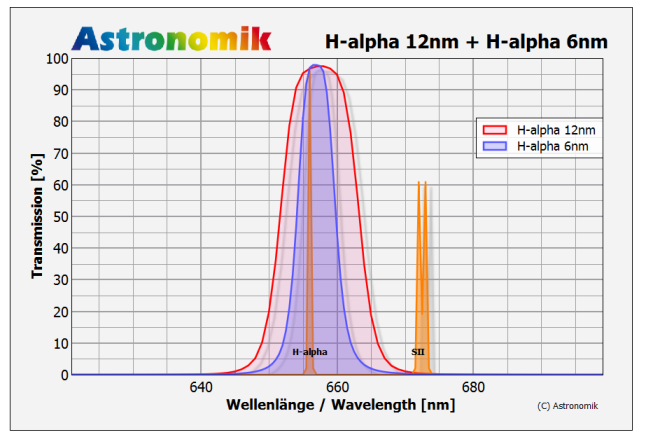 So the number of fr example "H-alpha-photons" does not change significant wether a H-alpha filter is installed or not. But looking at the photons of other wavelength, which wi do NOT want to record makes the effect of the filter clear: The combination of a very good blocking of all unwanted light from UV up to the IR and the narrow bandwidth of the filters reduces all unwanted signal on the sensor! 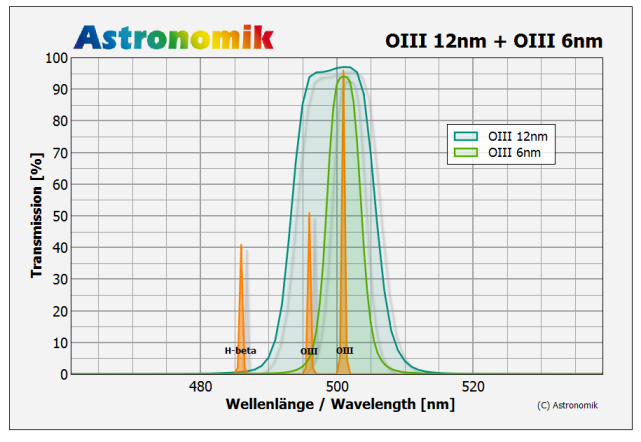 If you do an exposure of 30sec without any filters from a lightpolluted urban observing site, your sky-background might be allready very, very bright or even saturated. The same image taken with an Narrowband-Emissionline filter will give you a perfect black background without any signal and the signal from the object will be about the same. With this black background you have the possibility to expose longer -propably 30min instead- to record fainter structures! So itś not a "must", it´s a "may".